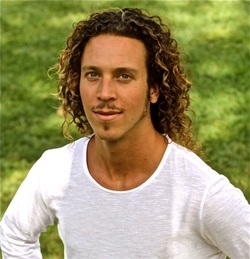 Gabriel Logan Braun: "The Sound Temple"
The Sound Temple with Gabriel Logan Braun is a healing journey of mindfulness and movement. It's a dynamic and improvisational expression in response to what's needed in the room to create a deeply healing and restorative experience for the participants. 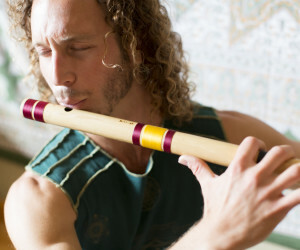 As a multi-instrumentalist, Gabriel uses loop pedals, his voice, flutes, crystal bowls, didgeridoo, percussion, harmonium and guitar to create a unique melding of sounds for people to relax, de-stress, harmonize and embrace the depth of our sacred inner-world. From his angelic tones to soulful beat boxing, Gabriel's heartfelt and earthy sound comes through his music to create experiences for people to celebrate the human spirit. By creating timeless and expansive soundscapes where there is nothing for the mind to hold onto, this allows for participants to really let go and unwind from their day. At times, light percussive vocal rhythms and harmonies are interwoven to create a feeling of containment and safety which allows the mind to better focus, the body to relax and the nervous system to return to homeostasis. Welcome, you have just returned home.